The Series 2675 Epi-Stack is an extremely high power, 905 nm pulsed diode laser capable of 75 W peak output from a 200 x 10 μm emitting aperture. 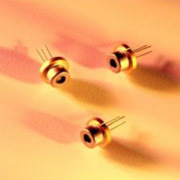 Each laser is a single, monolithic chip that incorporates three high efficiency, epitaxial stacked emitters. The lasers provide high power from a small emitter area, providing simplified system design and lower overall cost in a rugged, hermetically sealed 5.6 mm package. Defense applications include LiDAR, range finding, illumination, security-detection, and ordinance fusing-ignition. Industrial applications include commercial range finding, illumination, security-detection, and ordinance fusing-ignition. Industrial applications include commercial range finding, adaptive cruise control, geoscanning-mapping and cellometers. 400μm core fiber coupled version of these devises is also available on request.